A clear-eyed view of psychiatric disorders and how drugs may help, Drummond’s guide recognizes both the complexity of the subject and medicine’s inadequate understanding of the underlying physiology. Psychiatrist Drummond points out at the start that psychiatric problems are not like other medical problems. First, there is so much unknown about causes and treatments (even the mechanisms of some treatments considered standard are not fully understood); and second, people vary infinitely both in their psyches and in their responses to treatments. Above all, considering the level of distress that is present before most people even seek out a psychiatrist, it is almost impossible to act as an informed patient. “Trying to manage their distress, talk to a doctor they’ve never met before about intimate details of their lives, understand what the doctor is saying about their problems, learn about the different treatment options, and decide between different medicines that are completely unknown is extremely difficult.” Drummond never oversimplifies here, first considering “The Myths about Medication” (media reporting on psychiatric issues is notoriously unreliable). 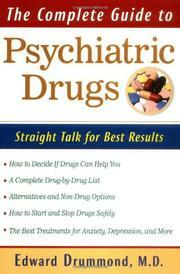 Part II (“Is Medication for You”) makes clear the complexity of this decision and offers guidelines for the process. Part III describes the various psychiatric syndromes and their treatment, and Part IV offers a detailed, alphabetically arranged guide to the medications (including alternative remedies). What we don’t know, what we do know, and how best to proceed—an invaluable guide for those in a supremely difficult spot.